In our January 6th, 2012, article, we reported the performance of a collection of USB 3.0 notebook drive enclosures and USB 3.0 flash drives. In this installment, we benchmarked several 3.5" form factor USB 3.0 drive enclosures. We tested them using both the HighPoint RocketU Quad USB 3.0 host adapter installed in the 2010 Mac Pro hex-core. With one exception, we installed a 6Gb/s SSD so that the drive can't be accused of being the bottleneck. Since some enclosures also had eSATA ports, we included those results using a RocketRAID 2744 SAS/SATA 6G host adapter. Finally, we included one 10Gb/s Thunderbolt 3.5" enclosure along with FireWire 800 and USB 2.0 examples for perspective. As with our previous tests, the USB 3.0 enclosure/host adapter combos did NOT attain the 5Gb/s (500MB/s) theoretical transfer speed of a single USB 3.0 data channel. 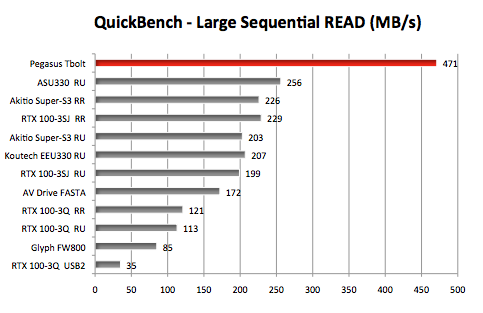 And, as you can see from the graphs, the Thunderbolt example beats both USB 3.0 and eSATA examples by a long shot. The Koutech ASU330 6G Device to SuperSpeed USB 3.0 Host Bridge Adapter is a "non-enclosure." 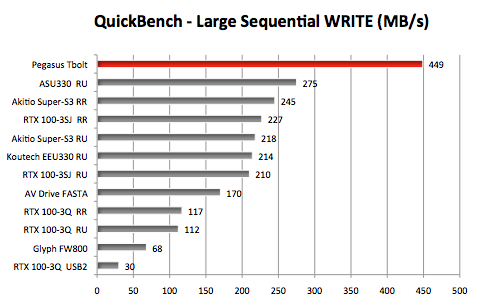 We included it to show it was faster than other USB 3.0 devices when connected to the fastest USB 3.0 host adapter. We're hoping some USB 3.0 drive maker will adopt this true 6Gb/s SATA to USB 3.0 bridge for their USB 3.0 enclosure -- especially if Apple decides to upgrade all USB 2.0 ports to USB 3.0 in future generations of Mac. Lastly, the FireWire 800 and USB 2.0 examples were included to show how "yesterday" they are by comparison to USB 3.0, eSATA, and Thunderbolt. Unfortunately, 'quad port' combo enclosures like the RTX 100-3Q suffer in performance compared to the pure USB 3.0, pure eSATA, and USB 3.0/eSATA enclosures.